FEN/Malamud Award for Excellence in Short Fiction. Other works Oates has written have become national bestsellers such as, “We Were the Mulvaneys” and “Blonde,” which also was nominated for the National Book Award. The entire campus community is invited to listen to Oates reflect on her writing in the Fine and Performing Arts Center on Tuesday, December 4 at 7:00 p.m. Admission is free. If you have never had a chance to meet a renowned author or well-known person in our society, this is a chance of a lifetime. With all the things going on at CCC, this is one of the events you do not want to miss. Going through college and maintaining a good grade point average, or GPA, is an important part of getting your college degree and paving the way to a new job. But, getting your foot in the door can be difficult. Internships can help you get experience and are good references for when you go job hunting. There are so many opportunities to participate in an internship with a company, you just have to go out and find them. Consult your advisor, who will help you find the one that is right for you and that fits the best into your field of study. Devan Paleschic, Communications major at Cumberland County College, is currently enrolled in a paid internship with Walt Disney World. She found out about internships through her advisor, Renee Post, who told her about past students who had participated in them and had been successful. She feels that this internship will enable her to become more responsible and give her connections for when she is searching for a job in the future. She says that, “it shows future employers that I am reliable [and] I have experience”, giving her a higher chance of finding a secure job. To complete her internship and earn the credits, Paleschic says, “I have to work 135 hours, I have to keep a journal, and write an essay before the semester is over. I have to show how this internship relates to my major and how it can help me in my career field”. The main focus of her internship will be “great customer service”, showing that she knows how to deal with people in a way that satisfies their needs and makes them happy while keeping up Disney World’s “Golden Standards”. Paleschic would definitely recommend other students to intern because she believes that internships give many benefits. She says, “You can learn a lot about the career field you are going into and also a lot about yourself. You might realize that you want to change what you want to do with your life”. She feels that being out in the field and actually being able to gain experience is much different than sitting in a classroom and learning about it. Cameron Meiswinkel, former Journalism major at CCC, interned at the Public Relations Department at CCC with John Nichols. He didn’t do the internship for credits at the college, he did it because he wanted to learn and accomplish something. He says, “It helped me become more professional… I don’t think anyone really knows how much work is involved in a job until they experience it first hand, and that’s what my internship helped me with”. Because Meiswinkel did the internship on his own and not for college credits, there were no requirements regarding the amount of time or work that he needed to fulfill to complete his internship. “I was given my choice of a few different projects to pursue. I ended up organizing a promotional video,” he says. He spent a couple hours once a week in the PR office organizing the video. He was in charge of contacting “students from the Student Pathways Leadership Institute to be in a promotional video for the college. [He] then contacted the video department and set up a time for them to film [him] interviewing the students”. He feels that doing the internship gave him an edge. He says, “Even though I didn’t go into the field that I interned in, I still believe it gave me an edge because it put me in a professional setting and taught me responsibility”. He recommends other students to take part in internships when they feel that they are ready for the responsibilities that they require. Meiswinkel says, “An internship provides a student with a taste of whatever field they are studying and teaches them to be responsible.” He says that doing an internship was fulfilling because it gave him a sense of pride for what he learned and accomplished. Internships are a very good way to get references for future jobs and experience to put on your resume. Employers will consider you more highly over other job applicants because you have actually worked in a professional setting and practiced the skills you’ve learned during class, not simply sitting in class and maybe paying enough attention to pass the tests. Internships can also help you realize whether or not you want to pursue the career path that you’re on. Experience, as well as good grades, is an important part of earning your degree. So, even if it’s not a requirement for your major, you should find out about interning. It will open up many doors for you and help you to feel more confident when you begin your first job. To discover your own internships go to our schools website at http://www.cccnj.edu. Click the link for future studenrs, then click future careers. Continue to brows through the different internships provided and follow the contact information provided to apply. Heather Ball is the store manager of our college bookstore, Barnes & Nobles. As the store manager Ball has the responsibility of hiring workers, ordering the books, and keeping the bookstore current with new gadgets. She has been working at the bookstore for 13 years. She started at the bookstore as just an associate, but has worked her way up to the manger position, which she has held for a year now. Ball’s love for her employees and co- workers is one of the main reasons as to why she stays employed here. No matter what problems Ball had, she always knew that she could rely on the people at work to get her through them. Ball has big dreams for the future of the bookstore. She hopes for an expansion for the store and a satellite for Clay College. She also wishes to turn the bookstore into more of a community Barnes & Nobles that sells more books. Ball is very people friendly and has the warm loving personality of a campus mother figure. On a more personal side, Ball is the mother of two daughters. Her oldest daughter is a 13-year-old academic scholar. She has obtained a scholarship to an all girl school called Padua Academy, which ranked top 50 in the states. Meanwhile, Ball’s youngest daughter is a 12-year-old actress and dancer, who decided that she wants to become an actress as her career choice. Besides working at the bookstore and being a mother, Ball graduated from Cumberland County College on May 20th 2004 while working diligently here at the bookstore, being a community counselor. She is a woman that works persistently in her community. She is blessed to help counsel girls about being anti-drug and anti-gang at Northern District Fellowship. Ball is the backbone of her family, manager of our college bookstore, and a mentor for girls at the Northern District Fellowship. She is continually trying to be an example not only for her daughters, but for other people as well. However, any student, smoker or non-smoker, can observe the multiple ashtrays that are within 25 feet of several buildings such as the library and the academic building. These ashtrays may entice some students to smoke close to these buildings since there are ashtrays so close to them. Are students supposed to guesstimate how far 25 feet actually is? Furthermore, there aren’t any designated smoking areas on CCC’s campus, so how can one truly tell where it is okay to smoke? Health issues were also a major point of discussion. Second hand smoke has been proven harmful. Is it fair that others who don’t smoke have to be affected by the toxic fumes smokers leave behind? When the class was asked how they would vote on a potential ban, it was split 50/50. 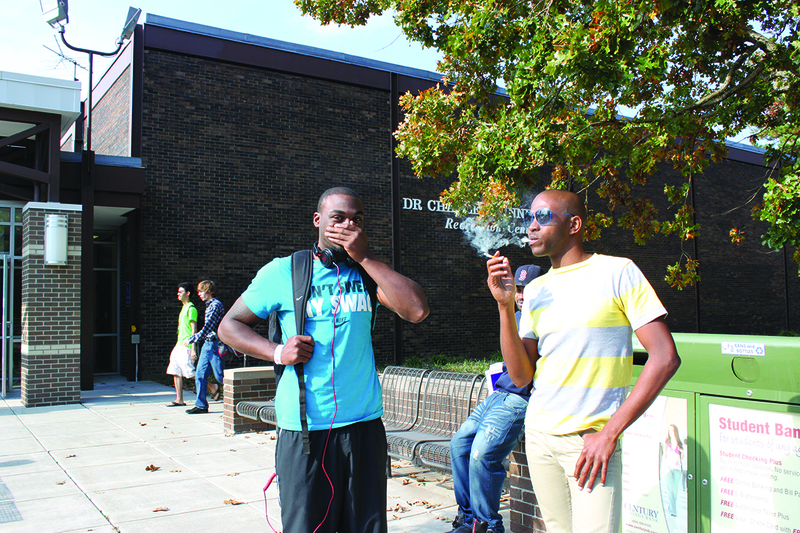 Half, of those who voted, wanted to see a ban on smoking on campus. The other half would vote against a ban. However, most of the class would want to see a compromise put in place rather than a complete ban. Joe Hibbs, CCC’s director of campus life and student services, said that changes would possibly be made to the current smoking policy in the near future. CCC’s student body had the chance to voice their opinion by filling out an online survey. Joe Hibbs, the Director of Campus Life & Student Services, shared that changes would most likely be made to the current smoking policy and that the committee that oversees the issue should have a recommendation to the CCC president by the New Year. The survey results will be considered when developing the possible changes to the current smoking policy. Compromise seems to be a popular resolution. There’s no doubt that smoking cigarettes is harmful for you and studies show that second-hand smoke is more detrimental than smoking cigarettes. But people do have the right to smoke, just as non-smokers have the right not to smoke. You can visit CCC’s website, http://www.cccnj.edu, for further updates in 2013. Winter is here, bringing with it long, chilly nights spent curled up by the fire. This is the season that is usually spent indoors because of the cold, but don’t let the frost keep you from having fun. There are so many things that you can do with your significant other in the wintertime. When the snow starts falling, covering the grass in a thick layer of white, grab your sleds and find the biggest hill in town. Have a competition to see who can get to the bottom the fastest or find out who can stand on their sled all the way to the end. If you don’t have sleds, anything smooth can work: plastic mats, vinyl cushions, plastic storage containers. Just make sure whatever you’re using has a flat underside and that it is waterproof. If you’re not a fan of slippery slopes or if there aren’t any near you, turn your backyard into a winter wonderland. Hold a contest and find out who can build the silliest or most creative snowman. Use anything you can find around the house to put together your creations. Make snow angels and have epic snowball fights and build forts together. Whip up some delicious snow ice cream with ingredients that can be found right in your cabinets at home. There are so many fun things to do when the snow finally falls. Ice skating is a fun way to show off your skills, or to get a good laugh. Teasing and being teased about wobbling on the ice or falling a couple times will definitely get rid of any awkwardness that either of you feel. Or, if you’re a really good ice skater, teach your partner some moves. When your feet get tired, take a break and flirt over cheese fries and hot apple cider. Skating around the rink, holding hands and trying not to fall, and laughing when you do, will bring you and your significant other closer as a couple. Taking a walk or a slow drive through town, looking at all of the bright, colorful Christmas lights with your boyfriend or girlfriend is so romantic. Most towns have at least one neighborhood that gets really into the Christmas spirit and goes all out when decorating. Some people’s yards are so full of decorations that they let you walk or drive around their house so that you can see everything. If you’re driving, be sure to roll your windows down because sometimes they have music playing in the background. After a long day of winter fun, have your significant other start a fire in the fireplace while you make some hot chocolate on the stove. Then, grab blankets and snuggle up on the couch while watching your favorite movies or playing your favorite video games. Or, take your cuddling outside. Spread some blankets down on a picnic table or the bed of a pickup truck and spend some time trying to find constellations and shooting stars in the sky. Even though the chilly weather requires a couple more layers, winter can be especially romantic with warm nights by the fire and flirty competitions in the snow. So, even after the leaves fall and the air gets cold, there are still plenty of things that you can do to keep warm. Are you interested in learning about art history? Students can register for Art History I, offered in the summer as a general education elective or program requirement. For those of you who desire more than a class to get to learn about history, they have the opportunity to travel to Europe to learn and appreciate art history. If you’ve always wanted to take a trip to Europe, specifically Scotland and England, this spring could be your chance. On May 18, CCC has a nine-day trip to study abroad. Of course, like everything, it will cost some money. However, if you contact Professor Sarah Shapiro, the fees are very affordable. The tour of these two fascinating cities comes with some convenient accommodations as well. On the first day of the trip, those who go will fly overnight to Edinburgh, the capitol of Scotland. Travelers will be able to find out more details about the city by the tour guide that will accompany them. The tour of the city includes a visit to the famous Edinburgh Castle. Day 4 is a free day to visit or shop. Edinburgh has many attractions, including over five captivating museums. One of those museums is the first of its kind. The Museum of Childhood lets you see numerous toys and games from different generations. The fourth day ends with a night train to London. The next day, a guided tour through London. Travelers see national monuments such as: Big Ben, Piccadilly Circus, Westminster Abbey and St. Paul’s Cathedral. On the sixth day of the nine-day trip, the group will visit the Tower of London. Inside the Tower of London is some of the best British food and shopping in the country. Day seven includes an optional trip to Stonehenge and the ancient Roman town of Bath. These two attractions are worth making a point to see. On the last full day in Europe, a free day to ride through London is scheduled. Travelers can shop at Harrods or Portobello Market. Other attractions include the British Museum and the Tate Modern. Don’t forget about riding the famous London Eye, an 800 passenger, 30-minute ferris wheel ride that reaches 450 feet high. The trip ends with a flight home on May 26. Pricing ranges from $2864.00-$3044.00 depending on what kind of room you choose. Included in the fees are the roundtrip airfares with meals on board, breakfast every morning, and dinner in Scotland on the first day and in London on the fifth day. Some accommodations include: a full-time, multi-lingual tour director. There is also the option for family to attend the trip along with you for the same fee. For more information on the trip and/or the class, contact Professor Sarah Shapiro at 856-691-8600, ext. 314. In order to register directly, you can go to eftours.com. Select “Students” and click “enroll in my teacher’s tour”. The tour number is 1198562. This is a great chance to get out and see the world.